The Baltic Branch of NCCA is proud to present Migration Card, the exhibition curated by Yulia Bardun, which will contemplate diverse facets of migration, viewing it as both a global phenomenon and essential part of the history of the Kaliningrad region. Throughout history, the Kaliningrad region has been largely a region of migrants, shaped by several waves of resettlements. Statistics show that its population grows continually, greatly due to migration inflows from other Russian regions and former Soviet republics. Migration is an abstract concept denoting relocation of people. What stands behind it in daily life are real people, their way of living, culture, traditions, hopes, dreams, sometimes shocks, failures and disappointments, sometimes — success, new home and social connections. 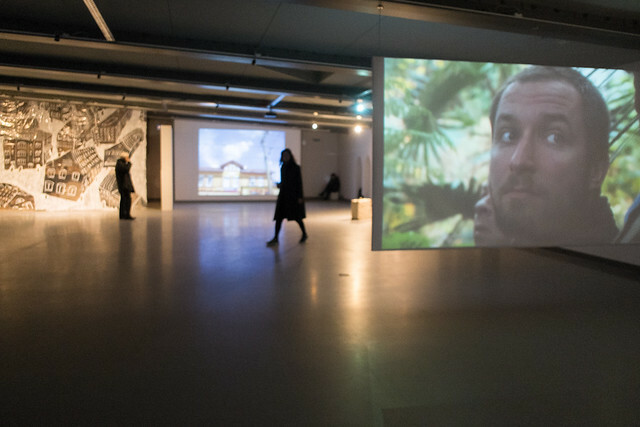 The video installation Kaliningrad and its people by Gudrun Wassermann (DE) presents a wide range of interviews with inhabitants of the Kaliningrad region who came there from other regions of the former Soviet Union in different times, or were born there. Their narratives reveal private stories of resettlement to the Kaliningrad region, first impressions of it, their contributions to historical and cultural landscape of the region as well as their dreams about its future. The object Christmas Tree by Evgeny Umansky (RU) from Kaliningrad and the sculpture Petrification by Ram Katzir (NL/IL) refer to the destiny of German population which once inhabited the region and had to search for a new home after the WWII. Project In the Cold by Ksenia Diodorova (RU), photographer from St. Petersburg, articulates other aspects of contemporary migrations, characteristic for many Russian regions. In 2014, during her trip to The Pamir Mountains the author of the documentary project about migrant workers from Tajikistan took pictures and collected stories of locals, whose family members went to Russia to earn a living. Having returned to Russia, the author started looking for relatives of her Pamir interviewees and collecting the stories on the Russian side. Eventually, meeting with labour migrants, Ksenia fulfilled the role of a messenger, bringing them news from their Tajik relatives whom they hadn't seen for a few years. In the Cold helps overcoming stereotypes about migrant workers from Central Asia: from faceless and speechless "means of production" they turn into people, whose dreams, expectations and hopes resemble much those of contemporary Russians. On the other side, the project FORWARD by the Kaliningrad artist Konstantin Trashchenkov (RU), films Sense of Warmth by Sven Johne (DE) and Birha by Ekta Mittal (IN) as well as the installation Palipaduazennie by Aleksander Komarov (BY/DE), refer to global aspects of migration: be it escape from economic problems, war conflicts or simply from one's own inner contradictions. The authors of the project hope that the interplay of the artworks presented at the exhibition will help to grasp multiple dimensions of migration and diversity of human experiences related to resettlement, finding new home and interaction with new cultural and social contexts.